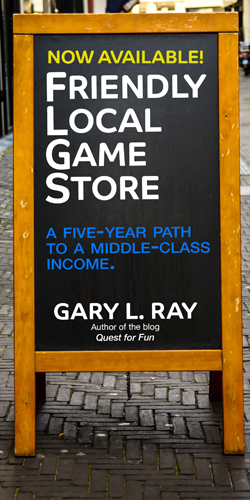 As you may have heard, I have written a book called Friendly Local Game Store. We've sold hundreds of copies the first couple months and it has eight, 5-star reviews on Amazon. Yeah! I thought I would do a bit of creative promotion of the book. Post a photo of you with the book, either the print copy or the book on your electronic device to my Gary Ray, Author Facebook Page. On August 10th, we'll declare a winner random (probably via some dice rolling method). What do you win? Why more books, of course! The winner can give me the names and addresses of two people they think could use this book (a $50 value). I'll sign and inscribe them, and send them off. It could be a copy for you, a potential new business partner, your staff or even your local store owner. Heck, send one to your competition as a gift! I won't judge (that's a lie, I'm always judging). I leave for vacation to Central America on Friday, so I look forward to seeing a bunch of happy photos when I login, lonesome for home. I was for it before I was against it but I came around again and have supported it for years now. I'm talking about Kickstarter. When games began emerging on Kickstarter, they were so unique and unicorny that I bought every one. Big mistake. Besides the duds, many didn't ship, taking my money which as a retailer, was often in the hundreds of dollars. 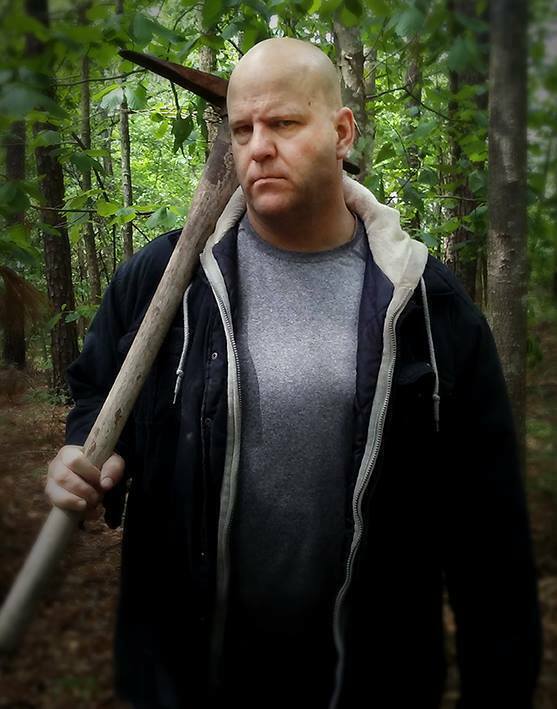 I'm still owed money by the Wizard Nystul and an extra from the Walking Dead. The old guard got their shot early on, including the undelivered Nystul's Infinite Dungeon. It's kind of ironic considering how the spell works. Kickstarter is a distribution method, not a design studio, so there's no reason to believe they're any better than traditionally funded games. The consensus is they're overall a little worse, actually. What they often tend to be are things that wouldn't make it through normal channels, the weird, the unwieldy, the wonderful. For that reason, I'm interested. Backing the right Kickstarter derived games gives my store a unique flair other stores don't have. This is especially true if I have to buy deep into a Kickstarter and I get the game early or it's only available through this method. I can use my size as a competitive advantage, a differentiator. However, what game designers need to understand is my goals are different than theirs. Their goal is to capture sales from as many end user customers as possible. I say end user customers, because I'm technically their customer too, but they would prefer to avoid me when possible. Game stores are the marketing arm and low margin distribution channel to get their game to those who may have missed their campaign. We're gravy, not the meat. My goal, as a supporter of their game, is to capture those customers from them, before they do. If I do it wrong, and announce a game offering a poor value proposition, I just used my efforts to drive customers to the designer. This obviously means that I'm trying to capture sales at the same time as them, while the campaign is going on. That's because I don't actually know if I want to back that game if I don't have customer interest, and with backer kits asking my to commit for more copies or thousands of dollars of add ons at the end, my ability to capture customers right now, before the game arrives, is incredibly important. We compete for customers, while also acting as partners. That's as new economy as it gets! It's also a terrible business model for the game trade. The game trade is a poster child for bad business models. As a retailer, if you see some new technology, Print on Demand, 3D Printing, Kickstarter, and you immediately think how this will enhance your business, you're doing it wrong. New technologies disintermediate the middle men. Consumers make the same mistake. 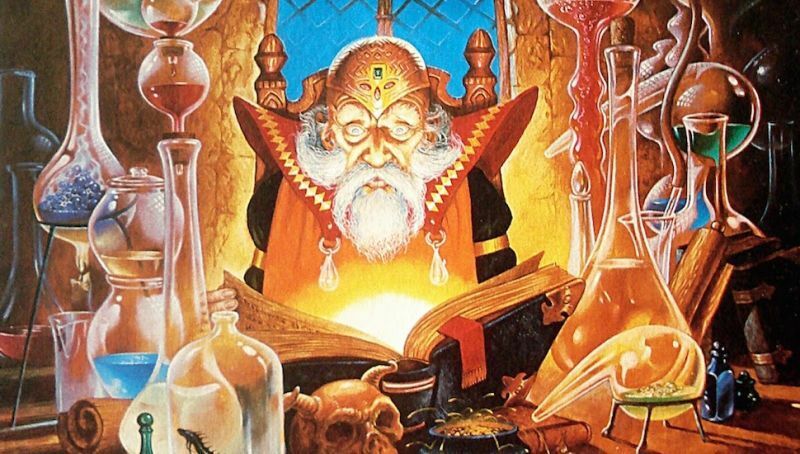 These same technologies won't create books printed in your living room or 40K armies banged out on your printer, they'll provide small press publishers the ability to create cottage industries where they sell you the weird, the unwieldy, and the wonderful when they couldn't have before. So how do I make it work? When I sign on to a Kickstarter as a retailer, I don't sit back and watch my money work for someone else for a year (or forever) and then tell customers about it once my far too many copies show up on some random day. What I do is promote that Kickstarter while the campaign is going on. I announce it to my customer group on Facebook. I let them know a pre order with me is safer than with you, the publisher. I offer a 10% discount to offset the rampant, wink wink nudge nudge, tax evasion that is the Kickstarter pre order system. Then I get to watch that pre order money work for me, while staying up at night wondering if the stretch goals for Dark Souls will ever arrive and what exactly my liability is if they don't. The publisher needs to understand we are at cross purposes. We are competing for the same customers. Their organized play or other attempts to get me to promote their game is so far off the mark to be laughable when I've got legitimate partners, without cross purposes. I will help you sell your game to my customers, but we are at odds with each other beyond that. Keep this in mind. Know that pimping your game with the word Kickstarter just tells me you're part of this special relationship that's only worth it for a tiny number of stores. For everyone else, the small stores, the distributors, and for a growing number of disillusioned customers, Kickstarter is the mark of death. But don't get all pouty about it. I may end up being your last friend in this equation. In a previous incarnation, I was an IT manager in a failing technology company where the blame would shift on a weekly basis, resulting in layoffs. This week it was the marketing manager, last week it was the head of development. Eventually the founder and CEO ran out of people to fire and the board fired him. In such an environment, with shifting loyalties, regular vocational executions, and no real consequences, morality tended to get a bit compromised. That's how I found myself rooting around on the HR directors laptop over the network. "Holy crap, she has the RIF list in an Excel spreadsheet called RIF List!" I became known as the guy who "knew things." People would come to me and try to wheedle out whether they would be alright or not. Or in the case of the company attorney, he would visit talking about cars and I would advise him now is not the best time to buy that Mercedes. Eventually my name appeared on that list, which meant my days were numbered. By the time I was laid off, I had been searching for weeks and already had a job lined up. When it comes to the game trade, I don't have a magical list pilfered from a laptop, but I do predict trouble. I feel a disturbance in my cash flow. As a potential new store owner, I would plot a trajectory. I would visit the next several distributor trade shows as well as GAMA. Is the industry doing better, worse, or about the same? Ask retailers at these shows what's exciting, if anything. If they aren't excited, that's a sign. Plot a game trade trajectory over your shows. The game trade is recession proof, assuming customers have jobs, but it has its own cycles you need to be aware of. The economy could crash during this research period. Doesn't matter, and in fact may help you with future lease negotiations. What's the trajectory of the game trade? That's what you want to discern. Ask 50 store owners, are you doing better, worse or about the same? Some successful stores are stalling out and looking around for ways to diversify. Other stores are circling the drain and talking about changing their formats, moving to small locations or closing entirely. It's hard to tell, on the whole, whether we're seeing more stores or fewer. New stores, undercapitalized, under researched, are still popping up quicker than the old guard stores are closing. While you do all this, raise more capital, perfect your business plan, figure out more details of your operation and what you really want out of all this. Take some community college classes to save money on skills you need. I recommend: Excel and spreadsheets, Quickbooks and accounting, small business management, website design, Photoshop and graphic design, and video editing. If you're handy, learn basic carpentry and home electrical. You'll need all of this. This is what I tell my 13 year old to learn, as he'll always have some extra cash if he knows how to do these things. If you've got a solid business plan, a six figure investment and a ton fo research under your belt, there is nothing that can stop you really. Even if you start in a down environment, everything is up for you. However, if you have no plan, a shoestring start up budget, and you're relying on some optimistic numbers to get you through your first year, and YOU ALL ARE, you need to time it right. It's like the stock market. You want to get in while things are going up. You can't predict the bottom, so don't think you can jump in then. You certainly don't want to be going down, because you really don't know how far down it will go. Right now I think we're heading into a down cycle, but don't trust me. I'm one of your fifty retailers. We're down about the same as last year, in a period when my business should be growing by double digits. I'm not looking for advice, thanks, I'm stating facts. If I am wrong, and I often am, you will have taken a year to raise money, educate yourself, acquire skills, and shake the hands of 50 game store retailers. You won't have the chance to to this again, so you win whether I'm right or not.